All transactions are safe and secure with a reliable history in online purchasing behind each of our associates. 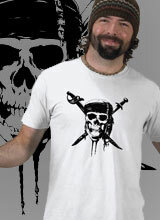 Buy the Pirates of the Caribbean Skull Logo t-shirt to own Pirates of the Caribbean clothing and merchandise. This design displays the highly recognizable Pirates of the Caribbean movie logo. This Skull and Swords tee is perfect for fans of both the POTC movie and the iconic Disney theme park ride. The classic logo is available on various forms of apparel, including sweatshirts and tank tops. It's okay to talk like a pirate with this shirt on because everyone will know that you're a fan of swashbuckling action and adventure. Various color Ts are also available. The skull and swords logo can also be found on mugs and glasses. In addition to the Pirates of the Caribbean Skull Logo tee above, browse the Pirates of the Caribbean Clothing Gallery for more apparel like men's and women's clothes, kids shirts or hoodies.